Browse our collections of high quality Lightened Flywheels. These Flywheels have been lightened and balanced to improve performance attributes. Manufactured to reduce weight and improve engine performance in a full range of Classic Mini models. Here at Mini Sport, we offer a specialist engineering service in which we will professionally lighten a flywheel to your required specifications in accordance with your engine. 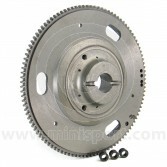 We are also able to supply lightened flywheels for a range of Classic Mini models.